Fish oil has garnered lots of attention in the last few years due to the benefits it can offer for both humans and pets. There are thousands of products on the market today for dogs– so sifting through them is no easy task. Even fish based dry dog foods have made a hit with dog owners everywhere. Fish oil supplements are popular for good reason, since it can give more benefit in its pure form than simply adding fish to your dog’s diet. Fish oil is widely known for improving joint health, brain function, skin and coat condition, and the overall health of dogs. Two of the Omega-3 fatty acids, DHA and EPA, are found in fish oil. These provide anti-inflammatory properties, and deliver various benefits for brain and heart health. The Omega-3’s are found primarily in cold water fish such as cod, herring, salmon, and mackerel. Senior dogs can benefit greatly from fish oils, as it can ease some of the inflammation and swelling in their arthritic joints, as well as lowering blood pressure and cholesterol levels. This is especially helpful to larger breeds like Labradors, and German Shepherds who often have joint health issues in their later years. Puppies also need certain essential oils in the diet to aid in developmental growth stages. In fact, DHA is known to play an important role in cognitive development. Another great point is that it adds a boost to a puppy’s young immune system, giving them a better chance to fight off any infection or diseases during this vulnerable life stage. Dogs with skin conditions can attain much needed relief with the addition of fish oil to their diet. Not only can skin conditions be improved, but your dog’s coat will start to shine, too. Dogs with certain food allergies may also benefit, but in the case of severe allergies discuss with your vet before using any supplements. Liquid – Comes in a bottle, and is usually poured on kibble in small doses. Tablet – Can either be punctured and squirted on kibble, or swallowed whole. Most dogs won’t do this, though. Chews – Made specifically for dogs as a chewable treat. Usually flavored. There are two types of fish oil, and it depends on which fish they were sourced from. There is fish oil, and there is salmon oil. Fish oil is made from various cold water fish species, while salmon oil is only made from salmon. Look for quality when buying fish oil supplements for your pup. Look at the back label to see if any filler or preservatives were added. You should only be looking for pure 100% fish oil, as this is its most natural state and will yield the most benefits. Do understand that better quality products will be pricier, but well worth your time. You don’t want filler and preservatives going into your dog’s diet, you want them to remain healthy. Containing up to 120 milligrams of EPA and 130 milligrams DHA per gram, Zesty Paws’ Pure Salmon Oil packs a double punch with those Omega – 3’s. It also only lists one ingredient on its back label : salmon oil. Great news for owners looking for pure sources of fish oil for dogs more sensitive to any added ingredients that may trigger allergies. This brand makes their product available in liquid form, chewables, and gel caps. Zesty Paws offers a helpful guide on daily dosage, depending on weight on each package. 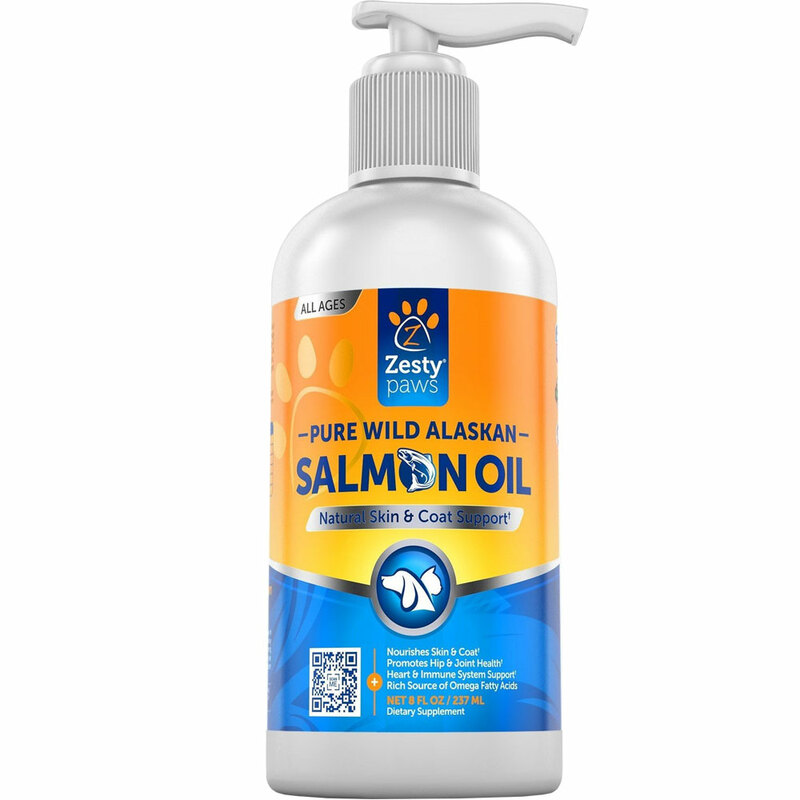 Zesty Paws Pure Salmon Oil has a solid balance of fatty acids for dogs, along with being reasonably priced. Owners also have the added benefit of choosing what form to give the supplement whether in liquid, chewable, or gel tab. Grizzly Salmon Oil is a popular supplement that carries excellent amounts of EP and DHA, along with 13 other fatty acids not found in other fish oil products. This product is sourced from wild Alaskan salmon known for their high amounts of essential fatty acids that contribute to overall health including cardiovascular, central nervous, and immune systems. Take note of the salmon’s higher concentration of EPA, which can deliver observable results for inflammatory conditions. Undoubtedly, your dog’s skin and coat will be thanking you. Grizzly’s Salmon Oil has been used by a wide number of pet owners with high marks in product reviews. With the extra 13 fatty acids in this formula, it’s possible that the benefits will be farther reaching for your pet, whether young or old. This company makes both pet and human grade products, all sustainably-sourced and non-GMO. Using sardines and anchovies as sources for the fish oil, Nordic Naturals Omega-3’s formula also contains no added ingredients such as rosemary oil, or any flavorings. Nordic Naturals offers their fish oil products in the triglyceride molecular form—the form naturally found in fish, and the form your body most easily absorbs. Nordic Naturals Omega-3 supports brain function, cardiovascular system, and eye development and overall health. There is also a suggested daily use guide according to your pet’s weight. The Omega-3 line comes in liquid and soft-gel forms, and is also within reasonable prices ranges for most owners. Sea Pet offers their Omega-3 fish oil line in both liquid and capsule forms. This brand uses human grade, biologically-available concentrated omega-3’s in its formula. The product boosts the immune system, and promotes the health of your pet’s skin and coat. The company states that results can be seen within 2-3 weeks, and that after 4-5 weeks pet owners should gradually lower the dose they give down to the maintenance level. Sea Pet sells various amounts of this product, going from reasonably priced 8 ounce bottles to a one gallon jug that will cost about $80. Depending on your dog’s needs, or how many extra pups you have at home, you might find it more economical to buy the jug just to have on hand. Once opened, it does need to be refrigerated. Sea Pet also offers a similar product with added vitamin E, which may have further benefits for your pets. Take a look, it might just be that something extra you need. 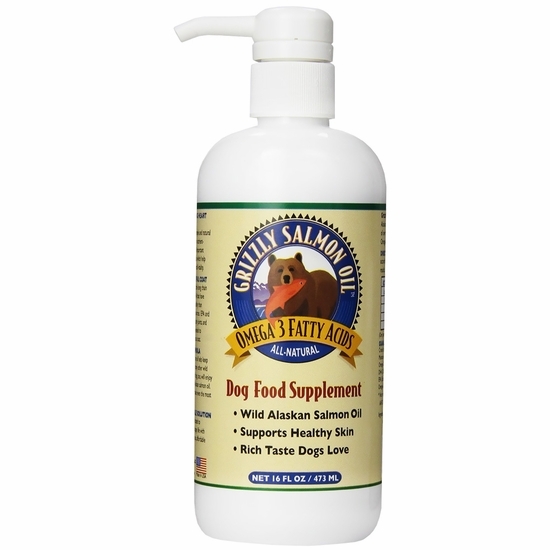 Only available in liquid form, Alaskan Naturals’ Wild Alaskan Salmon Oil is a worthy addition to the list. Made in the USA, and a sustainable source from wild Alaskan salmon with high concentrations of EPA and DHA to promote healthy brain, cardiovascular health, immunity, skin and coat. 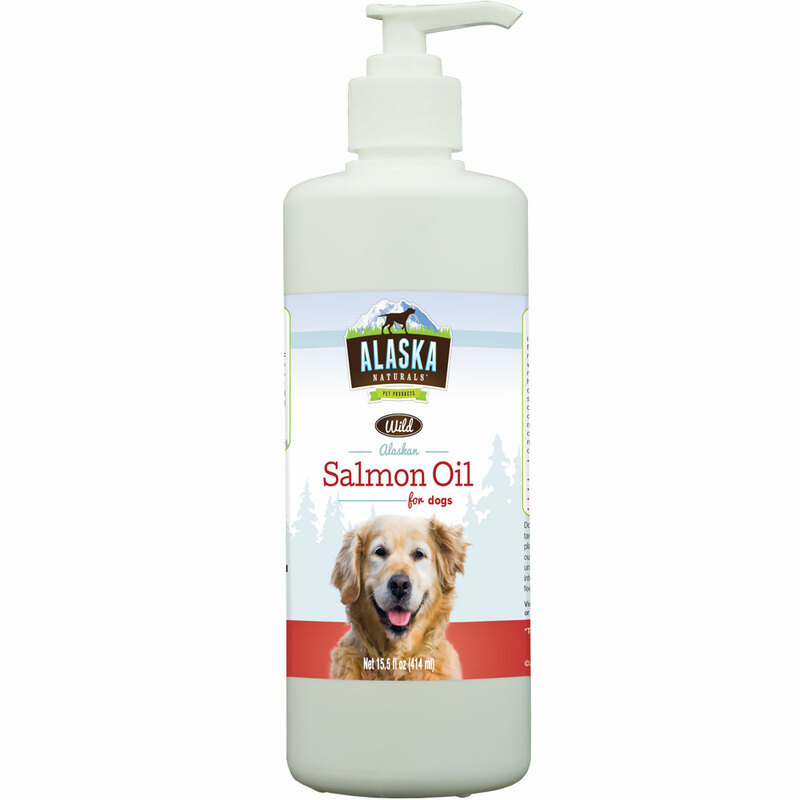 Wild Alaskan Salmon Oil has no added artificial preservatives, colors, or flavors. Another key point to note is the extended shelf life by the company’s nitrogen-purging to remove oxygen from each bottle. Alaskan Naturals provides an affordable fish oil product that is free of any potentially allergy-causing added ingredients. The Wild Alaskan Salmon Oil product line can be purchased in small 8-12 once bottles, and the larger 32 and 64 ounce bottles. Ultimately, fish oil supplements can be beneficial to many dogs in various conditions and life stages. Now that you are aware of the qualities and benefits of these supplements, you have a better idea of what may work for you and your pup. Always remember to check with your dog’s vet before starting any supplement regimen in case of any drug interactions or adverse side effects.